Released on iOS and Android just in time for most fans to be distracted by Episode Prompto, Final Fantasy XV: A New Empire is a generic multiplayer kingdom-builder with FFXV assets laid over top. Hooray. The free-to-play mobile game starts off promisingly enough. Those are definitely Final Fantasy XV characters right there. I see Prompto and Gladiolus and Noctis and Ignis. It all checks out so far. But then you get into the game and . . .
. . . oh wait, that’s just an ad. Then you get into the game and . . .
. . . sorry. Then you get into the game, and it’s immediately apparent that this is the same sort of multiplayer kingdom-building strategy game folks have been playing on mobile and Facebook for years. Noctis plays the role of tour guide, walking the player through the initial moments. Buildings must be upgraded with resources to build more buildings to produce more resources. 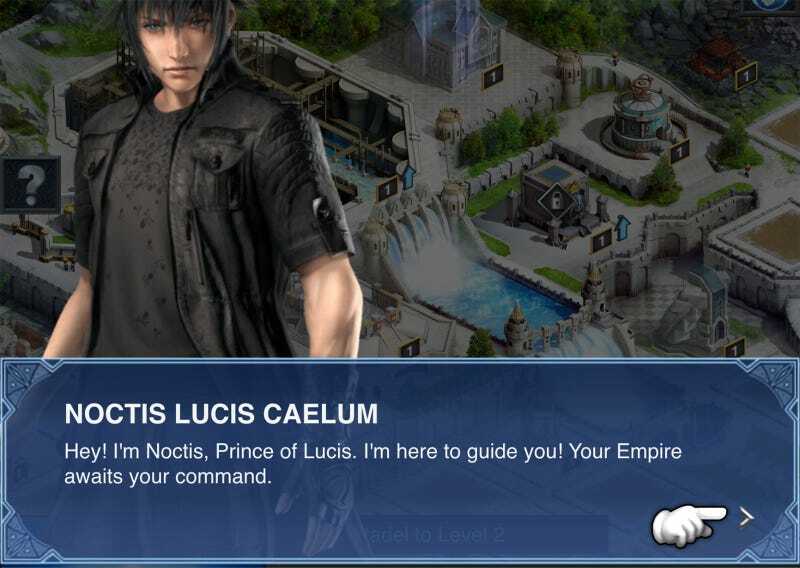 Noctis also stars as the player character’s hero in the game, using his resources and battle skills to slice the odd enemy until his resources run out. Additional characters are on the way. I assume they’re just waiting on the clip art. Seriously couldn’t find a shot of Gladio for this? It all sounds very vague, but that’s because it is. The game gets you started on upgrading buildings and doing research to unlock new troops and armaments, but doesn’t really tell you what to do with any of that stuff. I clicked on prompts and upgraded buildings for a good hour and still have no idea what I am supposed to be accomplishing. It has something to do with all of the empires on the overland screen. There are resources to gather here and Final Fantasy monsters to commit resources towards attacking. For a game developed by something called Epic Action LLC, there’s not a whole lot of action here. If you’re the time of casual strategy gamer that looks at a screen like the one below and starts salivating, here you go. There is a series of text-based tutorials buried in the game’s maze of menus, but I was just so tickled by the use of random game quotes at the beginning of some of the entries that I couldn’t go on. Maybe I am being too hard on Final Fantasy: A New Empire. The people in the random guild I joined seem to be enjoying themselves somehow, so certainly there’s an audience for generic crap painted over with licensed characters. Maybe if I give the game a little more time I’ll . . .